I went to Target today to get a Brita pitcher since I am trying to stop using plastic water bottles, and stop drinking diet soda (might not happen right away). My last stop was my "office" as I call it since I spend so much time in that aisle thinking. 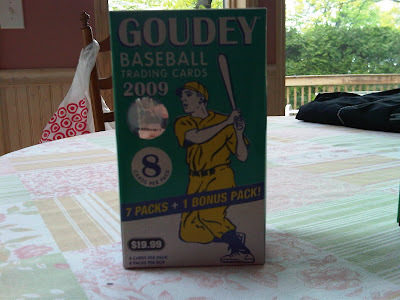 I discovered they had 2 2009 Goudey blasters. Since my mom picked the last one I got, I had her pick this one as well. I figured maybe she will pick another good blaster since I usually get air when I pick them. 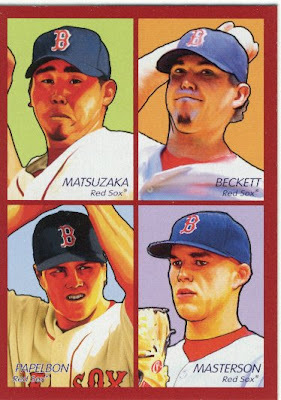 This was definitely a fun blaster. The only problem I noticed with the cards (aside from the crude drawings or whatever they are) is that the first card in each pack had minor damage to the upper left of the card. There looks like s slight indentation on each of the first cards. I don't mind the drawing or design, I expected it to be a little worse from seeing them on other blogs and eBay. They are by far worse looking than last years. I would have liked them more if they used the player depictions from last year on this years design. Even though there was no Pujols or Jeter card in the box, I did get 2 Joba cards and a few other Yankees so I'm pretty happy. I also drank a glass of my filtered water while typing this (win win). There are a great number of these that will end up in my binders, which I will probably work on at some point tonight or tomorrow along with putting my Heritage in binders. P.S. 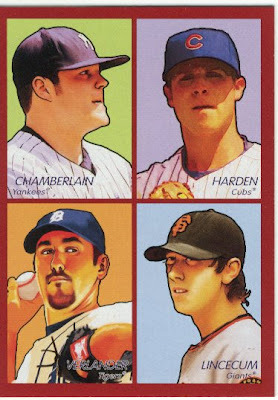 If anyone opened some Goudey and got and Pujols cards, let me know. A James Parr AND an Adrian Peterson? You mentioned a Clayton Kershaw card and didn't mention ME? I like the Brita pitcher. It's helped me cut down on soft drinks, too. Nice Yankee haul! I had no idea they were in the set. Now you will have me searching for those cards. Very nice pulls. 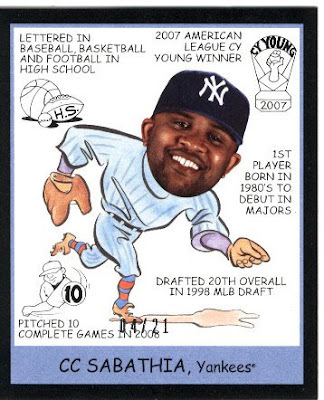 Now, maybe, just maybe, the Yankees can win a game! 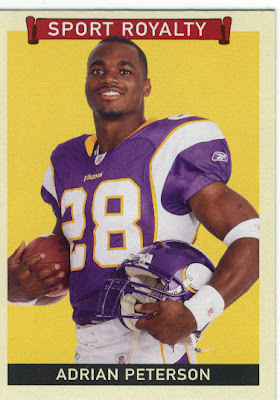 You wouldn't want to send the Adrian Peterson along to Minnesota, would you? 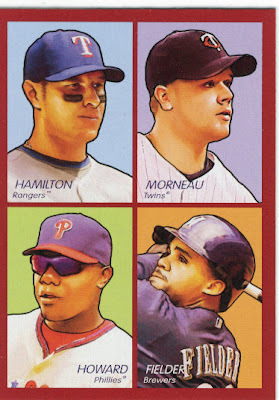 I have an 09 Goudey of Pujols - not sure if it's an SP or not - one of the Heads Up-ish cards like you pulled of CC. I set it aside for you, if you want it. I didn't like the quads when I first saw them, but they are really starting to grow on me. I like the player selection also. I hear you on the stopping soda thing (although I call it pop). At least you are hooked on diet, and not the hard stuff. I found switching to bottled water actually helped, because it was kind of the same feel in my hand. That, and double strength Nestea singles. 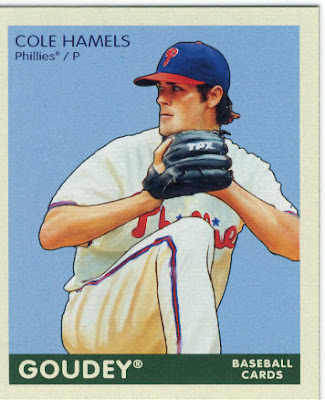 I opened a Goudey blaster and had the SAME issue with the first card in each pack and a small indentation on the upper left of each card. Trust me, it's not just the 2 we opened. I'll explain that later. 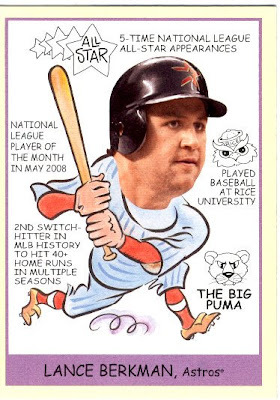 Pujols Heads Up (plus YSLs) is in the mail with Sooz's package. 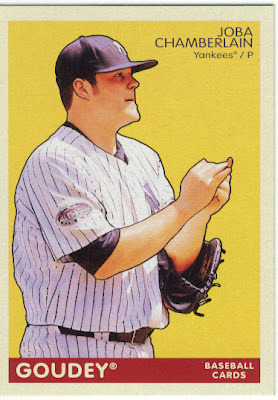 I concur on the small indentation of the first card in my blasters as well. 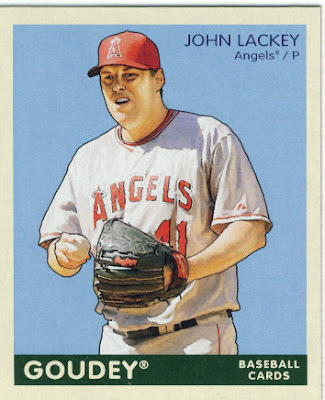 I'm still hoping I can run across a black numbered card in the last blaster I have to open. 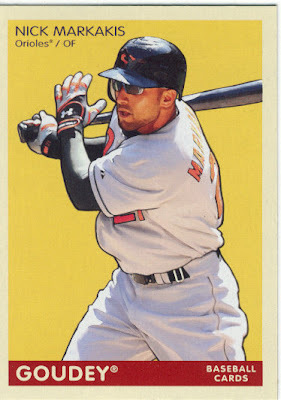 I saw some talk of Pujols and thought I'd mention I pulled a mini if that is of interest to you.